In any engineering or manufacturing facility, process control is absolutely vital to maintaining consistency and predictability. One simple and effective way to improve process control is through mechanical insulation. When facilities are being built for a specific purpose—for example, manufacturing a certain product—the calculations that are done to decide on specs rely on quite a few assumptions, like consistent operating temperatures. But in the real world, it can be hard to maintain the right conditions, and that’s why process controls are so important; to get as close as possible to those ideal operating conditions so that the plant can run smoothly and efficiently. One of the keys to process control is providing a stable environment. Since mechanical insulation is applied to ducts, pipes, and mechanical equipment, it’s particularly effective at maintaining continuous processes like temperature control. When systems exceed their standard operating temperatures, the process—or even the product itself—can suffer. Insulation helps provide predictability and reliability to mechanical systems by lessening the risk of overheating, freezing, etc. When insulation is included at the beginning of the road—for example, part of new construction—the projections about its effectiveness are based on the assumption that it will be properly maintained throughout its lifetime. That’s often why, when insulation begins to deteriorate, facilities managers choose not to repair or replace it—they don’t see the ROI they were expecting. But properly maintained insulation is a large contributor to effective process control and should be maintained with as much care as the rest of the systems in your facility. When you control the processes, you control the quality of your product. 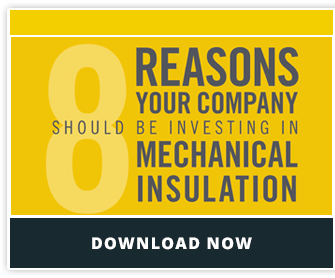 Mechanical insulation is a simple way to improve the way your facility operates.